Aon Diversity Solutions (ADS) acts as a centralized supplier and business diversity platform, designed to foster opportunities for diverse businesses in professional services through both internal procurement projects, as well as, external client engagements. We will advance good corporate citizenship by engaging stakeholders, advising decision makers, and driving accountability through supplier diversity best practices, processes and governance initiatives. At its core, our firm creates positive social impact every day. It happens when we live our values through our commitment to diversity, inclusion and opportunity. And, through the value we create for our client when we leverage our proprietary data and analytics to deliver advice and solutions across risk, retirement, and health. Our third party partners are a critical component of our ability to provide industry leading solutions to our clients. At Aon, we are committed to fueling our growth strategy by optimizing our spend base and driving operational efficiencies which maximize the investment we can make with these valued partners. Within our supply base, supplier diversity is a pivotal aspect that strengthens our service offering and reflects the diverse communities in which we operate. Our colleagues align with client goals and expectations through the engagement of diverse suppliers. When we realize growth goals and positively impact communities – that’s how we live and embody Aon values. Aon Diversity Solutions (ADS) advocates for historically under-utilized businesses to ensure diverse engagement which ultimately creates long-term value for our diverse partners, clients and communities. With a focus on top talent matchmaking expertise, rigorous vetting procedures and project engagement oversight, the team works to create win-win scenarios for all stakeholders. We are always looking for diverse suppliers who understand the unique needs of our stakeholders and offer innovative solutions to serve them. We focus on impacting internal and external priorities for both procurement opportunities and client project opportunities to expand diverse supplier Tier-1 and Tier-2 spend opportunities. ADS leverages internal strategic relationships across the organization to support supplier spend opportunities in the areas in which Aon operates. Whether you offer goods and services from IT software, to integrated marketing solutions, Aon encourages economic development by continuously striving to align with our supplier network within the diverse communities in which we serve. Aon is committed to a diverse supply base which reflects the demographics and values of our clients, colleagues and the communities in which we operate. In order to do business with Aon as a diverse supplier, you are required to set up a profile in our registration site to be considered for potential sourcing and business development opportunities. Q: I want to become a diverse supplier to Aon. How do I get started? A: Once you have received a confirmation e-mail stating your registration status has been Accepted, your information is entered into the CVM Solutions database that is provided to all internal business stakeholders within Aon. If there is a sourcing opportunity, our buyers and sourcing staff will access this database to search for suppliers based on keyword, geographical location information. If your company matches with the products or services that Aon is sourcing, you may be contacted to submit additional information. A: Once you have received a confirmation e-mail stating your registration status has been Accepted, your information is entered into the CVM Solutions database that is provided to all Aon Diversity Solutions business development management leads. To support our external client objectives, we value and routinely engage with diverse suppliers with sophisticated capabilities that compliment our core capabilities in the risk management and human capital arena. If there is a external client need, our ADS team will contact you to conduct a vetting process to ensure appropriate certifications and compliance to local and regional regulations. Once we determine your firm is an ideal match based on the clients needs and your competencies, ADS may secure additional information from your firm to activate the project engagement and implement the unique oversight processes. Q: What other action steps can I take to to increase my chances of becoming a diverse supplier to Aon? Q: When should I expect a response from Aon? A: Please allow at least 30 days from the time registration is downloaded for your companies information to receive feedback. Q: If I am already certified by a State, do I need to get certified by other organizations? A: Aon supports local, state and federal supplier diversity initiatives, certifications and classifications as well as, required licenses, where appropriate. Aon highly encourages and recognizes certification in the following organizations: NMSDC, WBENC, NVBDC, NGLCC and Disability:IN. Q: Does registering guarantee that I will obtain contracts with Aon? A: No. In an environment where corporate supply chains are becoming more complex and attracting increased visibility from regulators and consumers, at Aon, supply chain transparency is a critical imperative for managing rising levels of risk. We understand companies that seek to do business with Aon must demonstrate the ability to add value, and provide high-quality goods and services that are competitively priced, reliable, and aligned with our internal and external stakeholder needs. However, our clients, colleagues and communities want to know that we manage our procurement process responsibly, including where and how the goods and services we buy are created or sourced. We set high standards for the way we conduct business, and we expect our suppliers across all of our procurement categories to adhere to the Aon Code of Business Conduct to make an equivalent commitment. Our Code of Business Conduct represents Aon’s principles and our shared values, setting standards for how we work with each other, our clients, and our business partners. 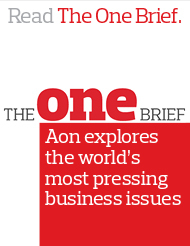 ADS invites you to learn how vital diversity is to Aon and the vital role partnerships play to make a local impact. It’s how we live our values and cultivate an inclusive culture. Shelly Brown joins the MBN USA to provide valuable insights and tips to certified diverse suppliers on what Aon values and expects from third party relationships. View news alerts at Aon Media Center. For inquiries beyond registration, please email us at diversitysolutions@aon.com.